I can answer that question: Yes. Yes, you will turn up again, and yes, your loud will turn up, too. And here’s my contribution to that: the TURN DOWN FOR WHAT Blog Tour. My partner in awesome, Chantel Acevedo, suggested that we make a writer’s blog tour that’s different than most writer’s blog tours. How is it different, you may ask? Because it brings the loud, and because this blog tour will turn down for NO WHAT WHATSOEVER. Here’s how it works: every writer tagged will choose two of the following questions, authored by myself and by the magnificently amazing writer and teacher Chantel Acevedo. The answers shall be loud. After loudly answering, the taggee becomes the tagger, and passes the baton of awesome on. 1) We know getting your work out is all about hard work, perseverance, & talent, but there’s always a dash of luck involved. So, name the luckiest publishing-related thing that has ever happened to you. 2) Your book has been optioned by Oprah. Who’s the star? 3) If your hometown threw a parade to celebrate your book, what kind of parade would it be? 4) Writing is sometimes a miserable experience. How do you drown your sorrows? 5) If you could be a box of cereal, what kind of cereal would you be and why? 6) Team Dickinson or Team Whitman? 7) Arthur Quilling-Couch said that in writing, one often has to ruthlessly cut what one loves most — in other words, “Murder your darlings.” What was your hardest darling to murder? 8) What’s the weirdest thing someone has said when you told them you are a writer? 9) If you could rewrite/adapt/rework any story by anybody, what would it be and what would you do with it? 10) Agatha Christie, as the story goes, created many of her stories while eating apples in the bathtub. How do you spark the story-or-poem-making part of your brain? Years and years and years ago, while I was teaching at Auburn University, I really like to take power walks. Like, seriously. Power walks. The kind of walks one takes with one’s grandmother in the mall. The only difference is that my power walks were also somehow really angsty and moody, the kind of walk one would take with one’s grandmother in the mall if one’s grandmother was Robert Smith and every store in the mall was Hot Topic. Anyway, so I’m taking this angsty and moody power walk and thinking in an angsty and moody and power-walk way about 1.) how broke I was and 2.) how I couldn’t get anything published. It was a Sunday during the fall semester, which meant that I was also walking through the detritus of several thousand of the several million college football parties that seem to pop up like beer-pong-playing mushrooms all over the place. Since I was angsty and moody and also incredibly clumsy, I kept my head down, looking dutifully at the ground, which looked dutifully up at me. And then I saw it: a twenty dollar bill. Just laying there, randomly, on the sidewalk. I looked around and couldn’t see a soul or car or anything in sight, so I decided it would be okay to take the twenty dollar bill, though I do still feel the kind of strange Catholic guilt about it that my grandmother (who wasn’t Robert Smith) instilled upon me during mall power walking session. I used that money as an entry fee for the Georgetown Review‘s fiction contest, which I thought was the longest long shot ever. I ended up winning the contest, and, two years later, through another bizarre stroke of luck, I ended up teaching at Georgetown College and working as the poetry editor of the very same magazine. This is maybe the hardest question because So. Many. Things. But I think the weirdest thing happened in the dentist’s office. I was already on another dimension, due to a muscle relaxer/happy gas combo that would’ve made Orin Scrivello gasp in disbelief, so I wasn’t sure at first that what was happening was actually happening. But it totally was: my dentist, who’d asked me what I did for a living before he turned on the happy gas and put ten thousand instruments of torture into my mouth, had decided to tell me the entire plot of his New Orleans mystery novel. There was a lot of mystery. There was even more murder. There were strange and gory scenes that hovered somewhere between a rating of R and NC17. And it lasted through a major cleaning and two fillings. I’ve never gone to the dentist since. Since I’m working on a memoir, I’m only casting me. 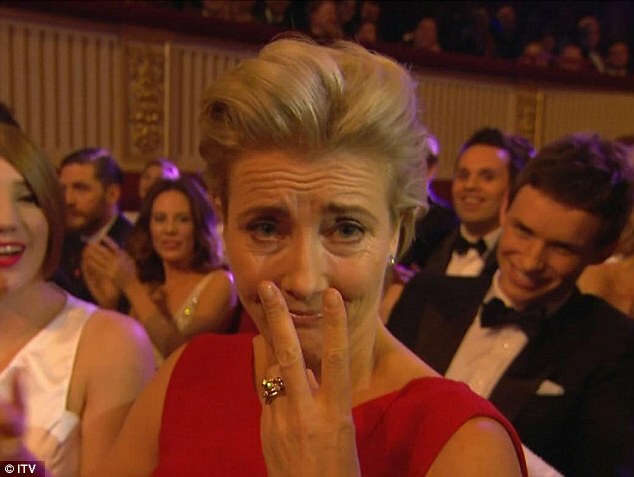 And if I’m casting me, I’m casting Drunk Emma Thompson At Every Awards Show. Natch. A million thanks to Chantel for working on this with me and for forever being my friend and metaphorical office-mate in LOUD. You can find Chantel’s answers here. 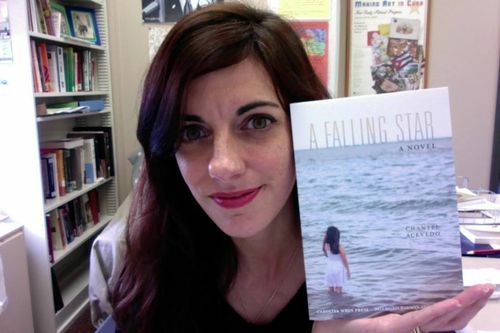 You can also find a copy of her amazing new novel, A Falling Star (previewed in the above picture!) on Amazon here or through Carolina Wren Press here. I’ve tagged the incomparable Stephen McClurg, author and teacher extraordinaire. For a preview of his brilliance, check out his Little Billboards haiku project, which is amazing and inspiring and breathes beautiful new life into the English language haiku. This is brilliant. I have been at the end of an assembly line manufacturing custom disappointment packaged in guilt. So this was so fresh and uplifting! I love the power of good writing. I may have just laid down a SICK rap because you said TURN DOWN FOR WHAT so many glorious ways in this. Also, can you please write that memoir and then cast that movie, thanks. From now on powerwalkers in my vicinity will be “Robert Smiths.” I will imagine his voice, hair and makeup nestled in workout clothes. I can’t decide which is louder: drunk Emma Thompson or Charlotte Rampling. My mind implodes contemplating such volume. Oh my God, I can’t even contemplate it — Thompson or Rampling? What if they were, somehow, together, drunk? Their very volume would smash the world. Only if you agree to do a cameo and in that cameo, lay down a sick rap! Aye, I have spent many a day on that very same assembly line, so I’m glad I could cheer you on your shift! Here’s the assembly lines of awesome packed in AWESOMER.